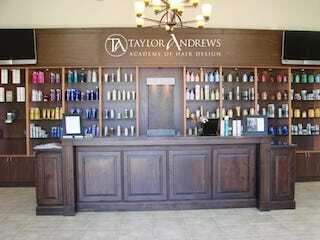 The Taylor Andrews cosmetology school in St. George is a beautiful, state-of-the-art facility that is conveniently located just off I-15 on River Road. Here, you can begin your journey toward a career as a world-class cosmetologist, esthetician, or makeup artist. When you attend your courses here, you’ll have access to all the resources you need to develop and advance your technical skills and prepare yourself for a career in the beauty industry. Make no mistake, this is a competitive industry, and the right education from a cutting-edge cosmetology school can give you the edge you need. Our teaching staff encourages and motivates our students to reach further and improve their skills until they feel confident providing these cosmetology services. We employ cutting-edge classrooms and teaching tools to ensure you experience prepares you for career success. Call us today to find out what sets Taylor Andrews apart from the competition.